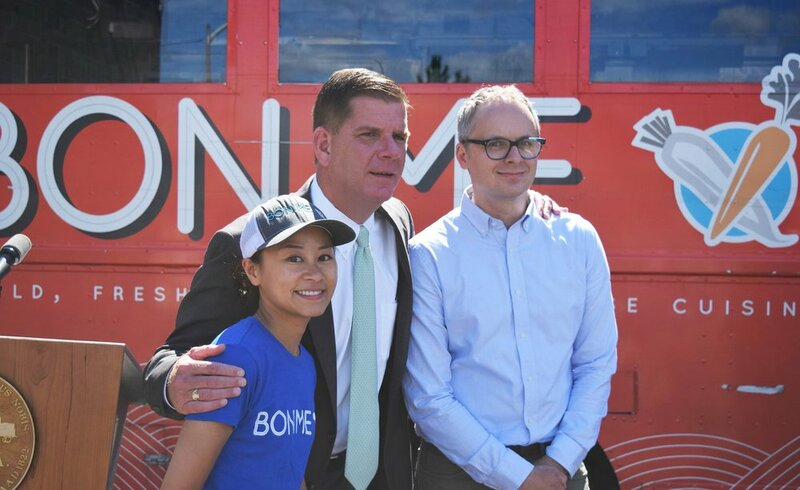 Bon Me started as a food truck dishing up Bold, Fresh, and Fun Asian cuisine to downtown Boston. As we grow, we strive to make a positive impact in the communities we call home by providing living wages for our employees, following environmentally sustainable business practices, and continuing to make healthy and delicious food at a fair price for our customers. On August 1, 2016, Bon Me joined the Fight for $15 movement. We raised our wages to $13/hour and our goal is to reach $15/hour by the end of 2018. We want to be leaders in the fight for fair wages in the service industry. More info here. We work to reduce our carbon footprint to lessen impact on our local and global environment. 90% of our packaging is compostable and we're developing systems to reduce food waste! In 2014, we won the Greenovate Award for Sustainable Food Systems from the city of Boston! Our food is Bold, Fresh, and Fun for a reason! We work hard to develop tasty recipes that can please any customer, and meet different dietary restrictions. From our housemade drinks to our soba noodle salads, we prep each item on our menu to be delicious and health conscious.